From early times, parcels and letters were carried to and from Bampton. Originally the mail was little more than Royal or Government documents delivered by messengers to the Lords of the Manors, and then only using the tracks between the main towns. Correspondence also passed between the church and the abbey to which it belonged, and the Lord of the Manor corresponded with his distant estates. In 1512 a Master of the Post was appointed by King Henry VIII, and private correspondence began entering the system, mainly between the few of the population who were literate. Mail was transported by private carriers, originally the packhorse trains, and during the 18th century stagecoaches began to be used. The mail was left at Receiving Offices in towns and villages, whence it was either collected, or taken by another carrier to its final destination. By the 17th century such a service was operating between The White Horse Inn at Bampton, and London, the London terminus of the packhorses being The Mermaid Inn in Carter Lane, Blackfriars. A letter taking this route then cost 6d., a hefty sum for the 1600’s. In 1830, mail coaches were leaving The White Horse daily for Barnstaple by South Molton, and Bristol by Taunton and Glastonbury, also taking passengers. In 1838 Post Gigs were running to Tiverton and Taunton daily, taking mail out in the morning and returning with mail in the evening. In 1695 a Post Office was established in Tiverton, which then became known as a Post Town, and letters from Bampton addressed to the west of England were taken there. It was established to relieve the main offices at Exeter and Taunton, which had already been in existence for about a century. Mail for all points north and east went from Bampton to Taunton. The system continued until late in the 19th century. A local Penny Post was introduced by Act of Parliament in 1765, which meant that letters were charged a penny for the journey to the nearest Post Town - Tiverton or Taunton. From there on, normal carriers’ rates applied, being based on distance but with a minimum charge of 4d. The mail was carried from one Receiving Office to another in relays, usually by the local Postmaster on horseback. Districts away from main and sub-offices had their mail delivered from these offices by a local carrier, again at a price. Letters often had four or five frank marks on them, one for each office they had passed through. The sender of a letter could not possibly know the cost of each part of the relay system, or how many parts were involved, and letters were often sent Cash-On-Delivery. In 1839 the standard fee for a letter to any destination in the United Kingdom became 4d., until the coming of the national Penny Post and the famous Penny Black postage stamp in 1840. One cannot but help notice the slow but steady reduction in postal charges! The White Horse Hotel and The Malthouse in Briton Street were known as Sub-distributors of Stamps. These were not postage stamps, but those used on Wills, deeds, and other legal documents. 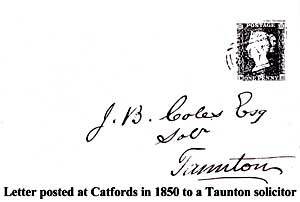 By 1810 Bampton was sorting and franking its own mail with a hand stamp showing BAMPTON-D/187. The D meant Devon and 187 was the distance in miles from London. In 1830 Bampton became a Sub-office, which meant that all mail could (again) be sent direct to its destination without stopping at Tiverton or Taunton for franking, and from then until around 1975 Bampton continued to collect, sort, and deliver its own local mail. All mail for local delivery was franked at Bampton and delivered by its three full-time and two part-time postmen, as far as Anstey in the west and Clayhanger in the east, but not entering Somerset. There were three deliveries: 7 a.m., 3.10 p.m., and 7.35 p.m. All other mail went un-franked to Tiverton. For most of the rest of the 19th century the Post Office was at Catfords, 19 Fore Street. The new Post Offices were given new numbers, which were issued alphabetically throughout the Empire from 1844. Letters posted at Catfords had the number 802 which replaced the old number, and was in the first issue of the new numbers. It was issued in April 1844, but did not come into use until September 1845, and it gave a horizontal impression within a circle. Later issues on 18th February 1878 and 4th April 1882 gave vertical impressions. By 1893 the Post Office had moved from Fore Street to Brook Street on the corner of Mary Lane, where there is currently a hair stylist. 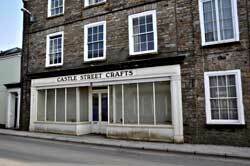 By 1897 it was in the present 6, Castle Street. In 1903 it made its last move to 29 Brook Street. 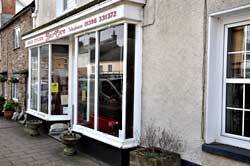 See below for the current photographs of these loactions - some dates of use as Post Office are approximate. Bampton Post Office was able to receive and send telegrams by 1883, and in 1908 Oakford was connected to this service by a telegraph wire. At that time, the Post Office opened seven days a week, from 7.00 a.m. to 8.00 p.m., except on Sundays when it opened for two hours from 8.00 a.m. When the Office was closed, telegrams could be received (but not sent) at Bampton Station, if the address was given c/o the station. The first mail collection boxes appeared in Victorian times, supplementing, and in time, replacing, the Posting Houses, which were collecting points for incoming and outgoing mail. 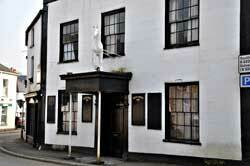 Both The White Horse Hotel and The Swan Hotel served as Posting Houses at different times in the 19th century. The ordinary working man neither sent nor received mail, and the boxes were placed in walls convenient to those people who had a use for them - the Manor House, large farms, near a Coaching Inn, or simply at an important crossroads. Some were put in place for prestige purposes for those who considered themselves important enough to have their own box, whether or not they needed one. Where a convenient wall did not exist, a free standing “pillar” box was used instead. 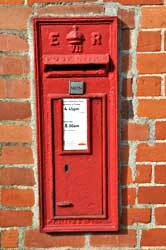 Many Victorian wall boxes are still in use, still occupying their original sites. One of the early wall boxes in Bampton, originally put in place during the reign of King Edward VII, was at the junction of Briton Street and the Tiverton Road, set into the wall of a cottage roughly opposite Packhorse Way and close to The Tiverton Hotel. It was removed by the Post Office in about 1960 for ease of access and replaced in the wall of Hillcrest in Briton Street. Another fairly early one, from the reign of King George V is set into the wall of The Exeter Inn. Occasionally a wall box will be found with a plain wooden door. These were fitted during the war years when metal was like gold dust, and whilst the odd one still exists, the one at Bampton Post Office was replaced many years ago and destroyed. More recently, the wall box at the Post Office has given way to a pillar box, the old one being too small to handle the amount of mail going through. A Posting House of the early 19th century is at 6, Castle Street. Set into a cobbled floor are two hard standing areas for coach wheels. Horses pulled the coach in from the road, were un-harnessed, and led into a stable for rest and a feed. The door into the stable is still there, and is much wider than would be necessary for humans to use, and only in 1993 were the hay stalls removed. Beside the hard standing is the strong-room, still with its iron grille set into a thick stone wall. The Victorian Mail Coaches were considered fair game to those of ill intent. The route used by these coaches from Tiverton to Bampton was by the old road, through Chettiscombe and over Bampton Down. One morning in the 1860’s the Mail Coach was waved down by a woman near Chettiscombe. When the coach came to a halt, the postman noticed that the ‘woman’ had hairy wrists. Sensing trouble, he gave ‘her’ a smart crack with the horse’s whip and galloped off. 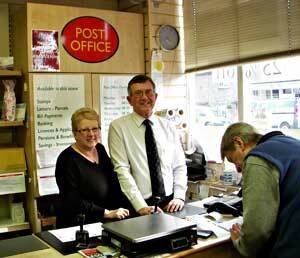 Bampton's Postmaster and Postmistress, Bruce and Claire Benton, on 19th March 2013 their last day in the post office in Brook Street. 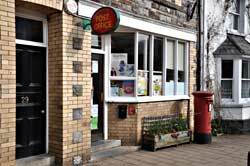 The Post Office has now moved to the Spar shop, Newton Square. 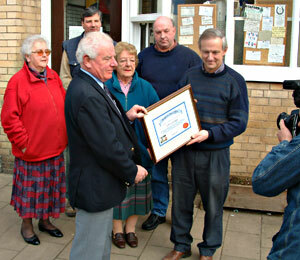 Below: Postmaster John Gullidge recieves a certificate from the Post Office after his 18 years service in 2003. 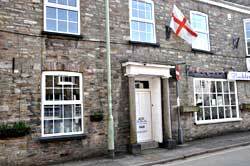 Note: If you can add information about the history of Bampton's Post Office, please contact the webmaster from site Home Page.